Monitor-Merrimac Memorial Bridge-Tunnel (MMMBT) is the 4.6 mile-long (7.4 km) Hampton Roads tunnel crossing for Interstate 664. 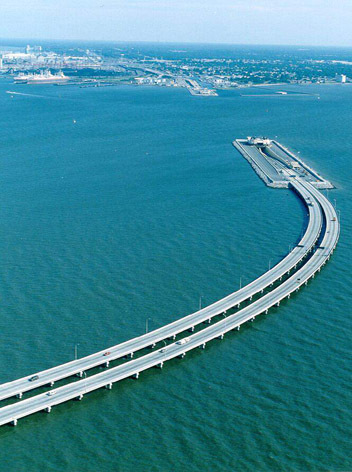 It is a four-lane bridge-tunnel comprised of bridges, trestles, man-made islands and tunnels under a portion of the Hampton Roads harbor where the James, Nansemond and Elizabeth Rivers come together in South Hampton Roads, in the south-eastern portion of Virginia in the United States. Interstate 664 is the 20.7-mile-long freeway that connects I-64 in Hampton to I-64/I-264 in Chesapeake, completed in April 1992. 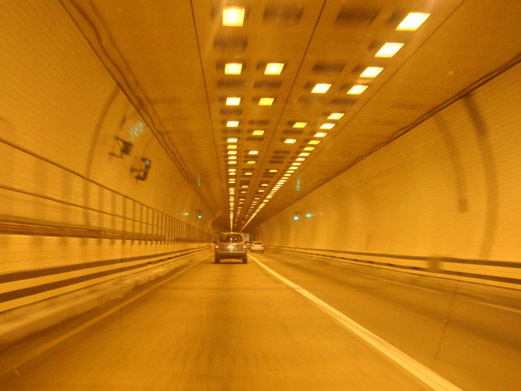 I-664 includes the 4.6-mile Monitor-Merrimac Memorial Bridge-Tunnel (MMMBT). The MMMBT cost $400 million to build, and it includes a four-lane tunnel that is 4,800 feet long, two man-made portal islands, and 3.2 miles of twin trestle. Northbound on the MMMBT is one of the most spectacular views on any road. Hampton Roads makes a “V” with one branch to your ten o’clock, and the other branch to your two o’clock. You see an enormous expanse of water, left, right, and ahead of you, with the landfall of the Peninsula dead ahead. On the ten o’clock branch, you see the Newport News Marine Terminal and Shipyards, on the two o’clock branch, you see the Norfolk Naval Base. Typically, you will see a couple Nimitz-class aircraft carriers moored in the distance, and many other ships. Another nice feature, is that the MMMBT is toll-free. The name comes from the fact that the duel between the two Civil War ironclads was fought less than a mile from the where the tunnel is today.